Normally, if we’re in one of those masochistic moods where we want to feel the cold fingers of terror, we naturally turn to cinema or literature. Settling down to watch “The Shining” for the seventeenth time, or jumping into some Lovecraft can usually scratch that particular (and peculiar) itch. 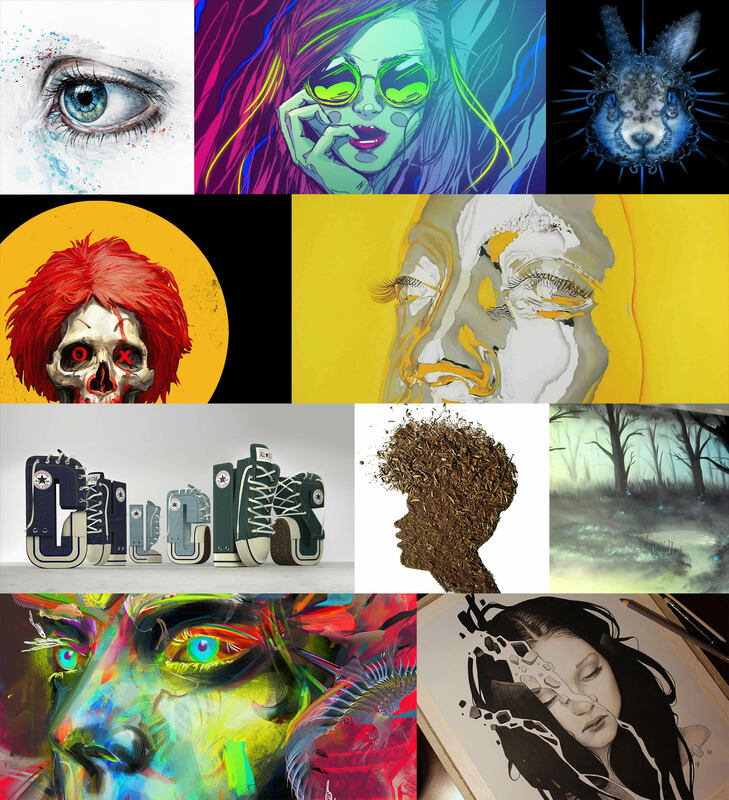 Rarely do we turn to visual art—but perhaps we should. From paintings to ornaments to installations, these 10 selected artworks are guaranteed to cause their fair share of grimaces and goose-bumps, either through their forms or grisly implications. Top: Pretty in red—innocence and experience in Helnwein’s composition. 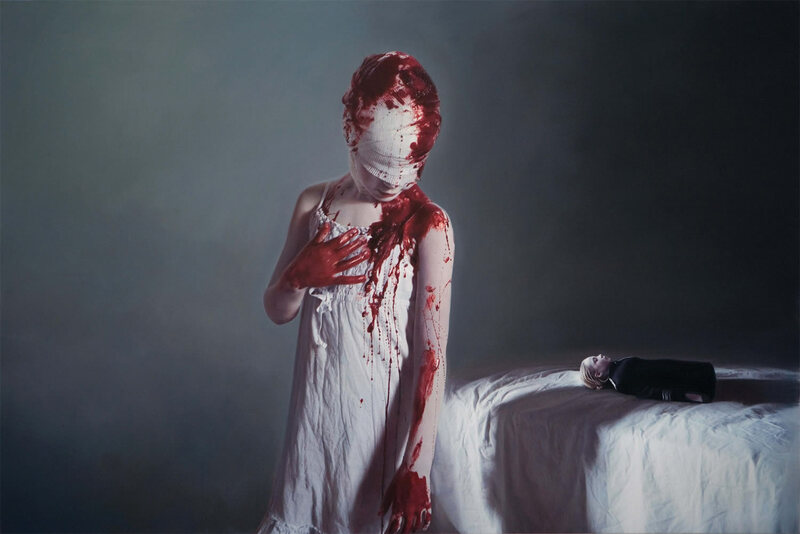 Image © Gottfried Helnwein. 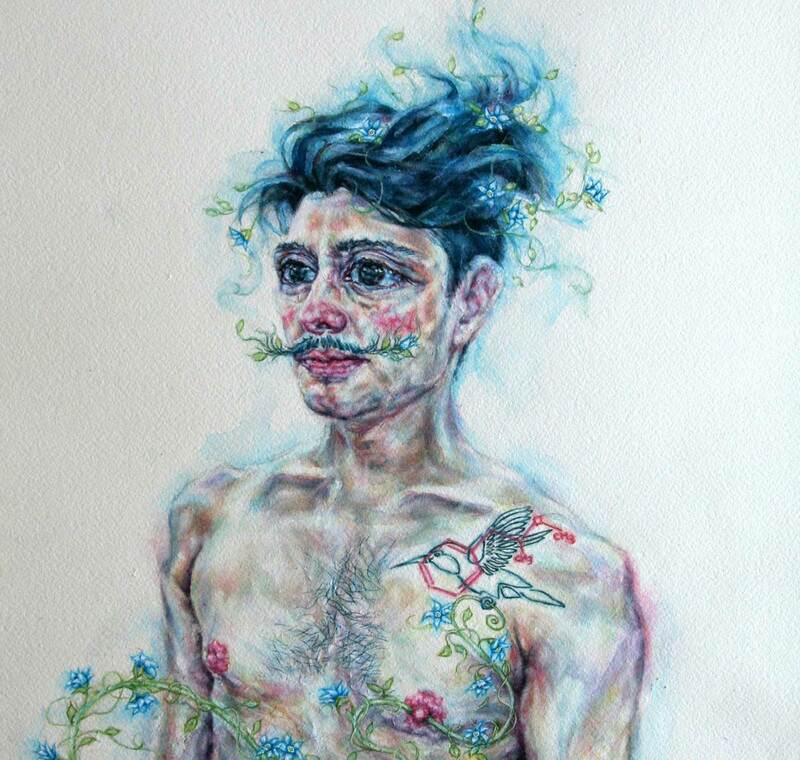 Faceless and twisted: modern beauty standards meet their match in Thein’s project. Ivonne Thein’s cutting exhibit “32 Kilos” takes aim at Thinspiration culture, size 0 models, and damaging standards of beauty in Western media. The photo shown above is just one of fourteen, with each portraying emaciated and anorexic models posing as if for a fashion shoot. In some cases, the models are wrapped in medical bandaging to represent the severity of the condition and to highlight that anorexia is not simply being skinny, but is a full-blown disorder. Perhaps even more disturbing than the exhibit itself is, that several pro-anorexia communities have declared Thein’s images inspirational. Gregory Barsamian’s every-men roll towards capture. View in animated form. “Die Falle” translates from German to “The Trap,” and depicts the journey of man during a state of dreamtime. The unnerving illusory movement is achieved through 19th century zoetrope technology: images, rotations, and light are utilised to create the illusion of animation. Our minds fill in the gaps to create a continuous movement, resulting in the stuttering progression of the contorted figures as they morph towards the mousetraps waiting at the top. 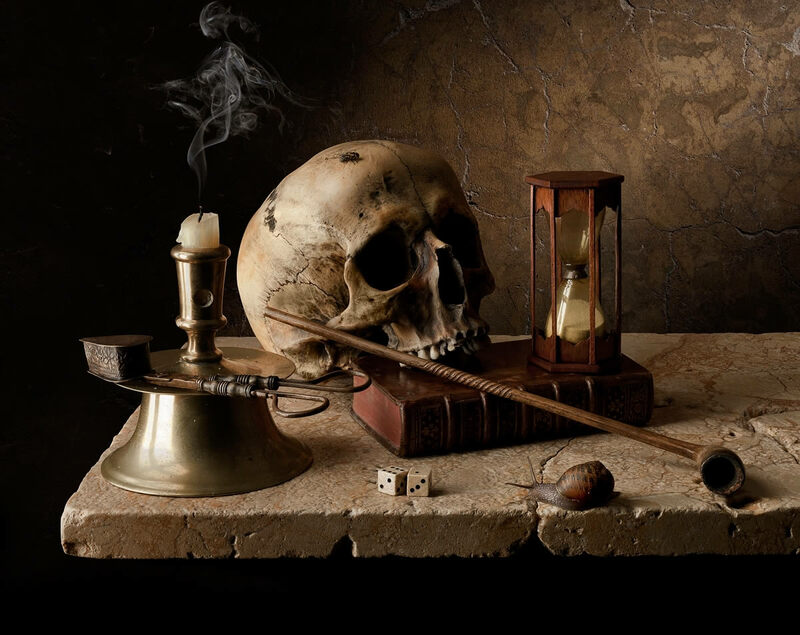 Gregory Barsamian’s “Die Falle” presents us with unsettling questions about the conflicts between the logical, the sensory, and the imagined. The organic expressed as the artificial in Mueck’s sculpture. It isn’t the subject of “A Girl” that is so unsettling, but rather the form itself: the sculpture is far larger than any baby has the right to be. 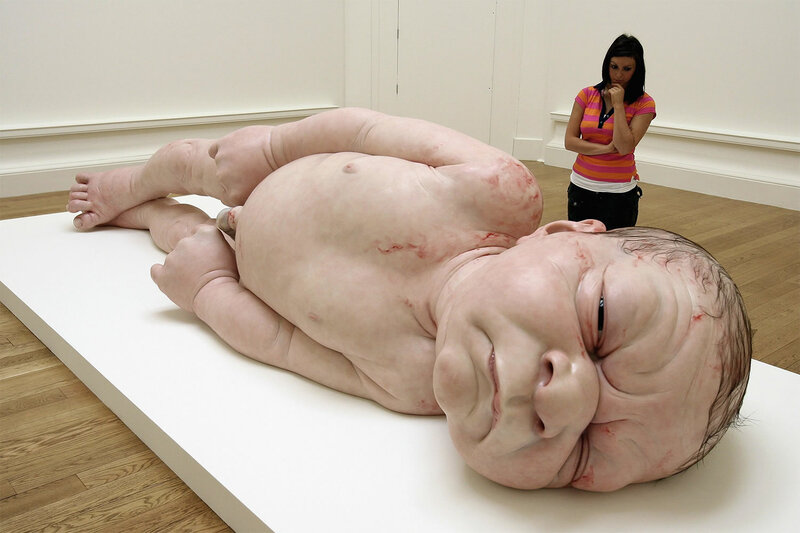 On top of this, and arguably more affecting, is the fact that Ron Mueck has exaggerated and accentuated the child’s features to the point of caricature. Deep carved creases in the baby’s face and the glistening film that seems to coat the flesh make this most natural and innocent creature seem alien and grotesque; these subtle accentuations are enough to elicit repulsion, but not enough to mask the baby. The consequent conflict of reactions in viewers is an additional disturbing nuance. 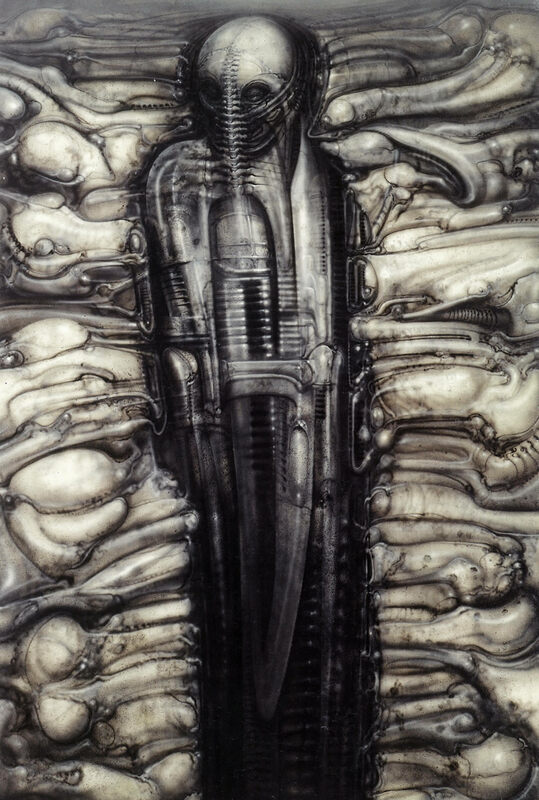 Biomechanical nightmare-landscape abound in the late H.R Giger’s painting. 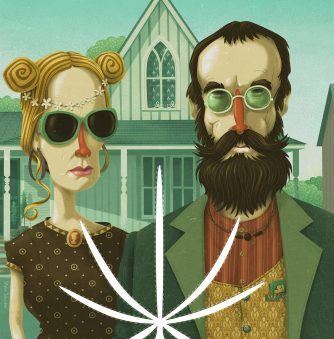 No list of disturbing artistic creations would be complete without a nod to the late king of the uncomfortable, H.R. Giger. “The Hermit” (Der Ermit) is part of a series of tarot cards all featuring Giger’s work, and is typical of the artist in merging the biological with the mechanical. In this case, a biomechanical creature lurks alone, nestled in a fleshy mass of phallic shapes. 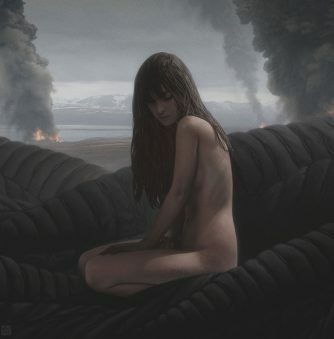 This can be interpreted in a number of ways: is it an allegory for sexual pressure? Isolation in a mechanised world? Perhaps, it’s best not to know. 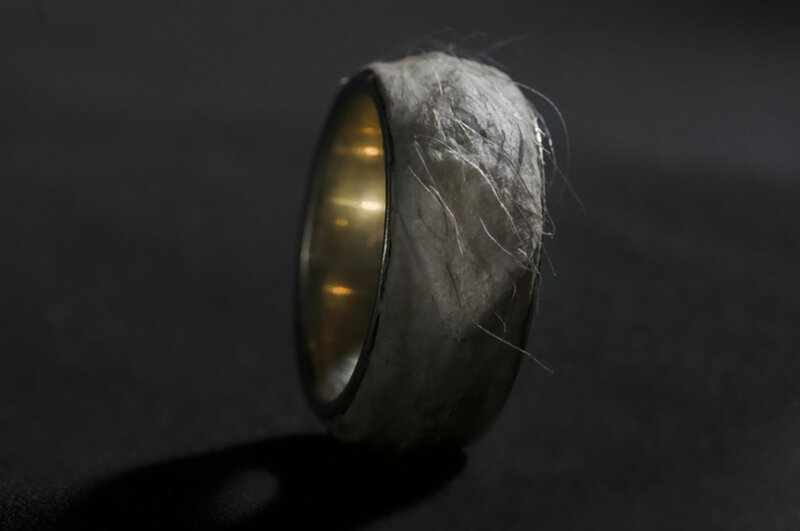 A second skin—Recht’s ring isn’t your average gold band. Arguably the most stomach-turning and twisted entry on this list, Sruli Recht’s “Forget Me Knot” is a ring made from a slice of skin from the artist’s own belly. The skin was surgically removed, salted and tanned, and attached to a 24 carat gold band that was then put on sale for 350,000 euros. 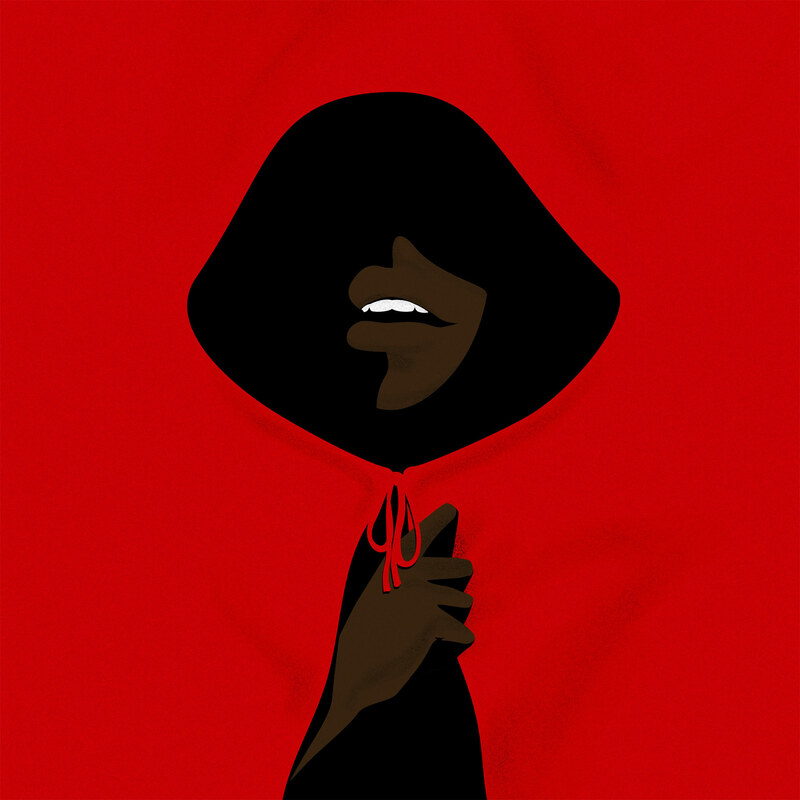 Surprisingly, this piece was actually the result of fashion design, though it’s hard to picture it adorning a model’s finger; but it was so grim that it had to be included. Besides, whether intended or not, the piece certainly makes some points about the cost of excess. Myra Hindley’s gaze loses none of its terrible power in Harvey’s painting. 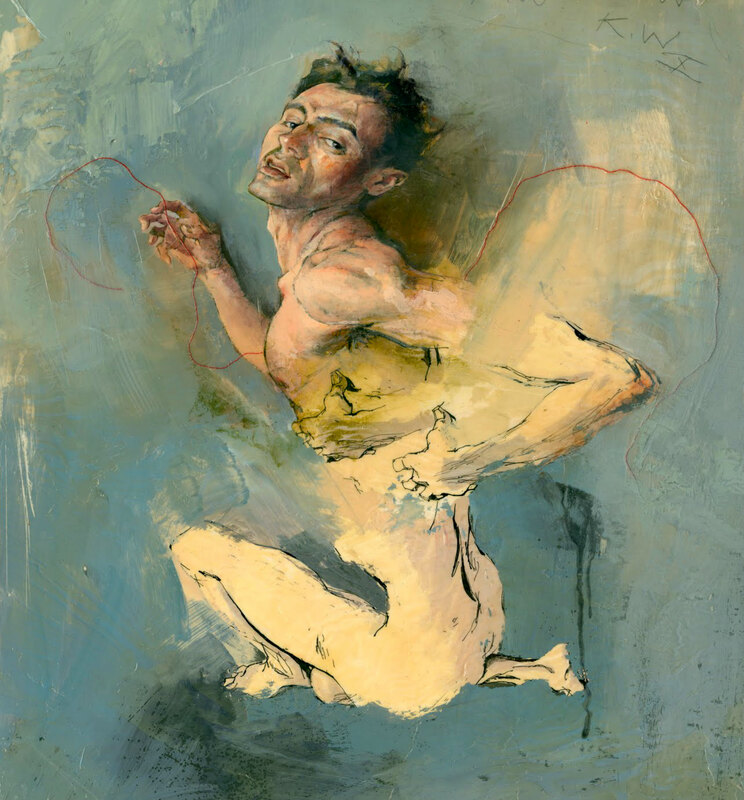 This notorious painting by Marcus Harvey caused a wave of controversy when it was exhibited in 1997, and it’s easy to see why. 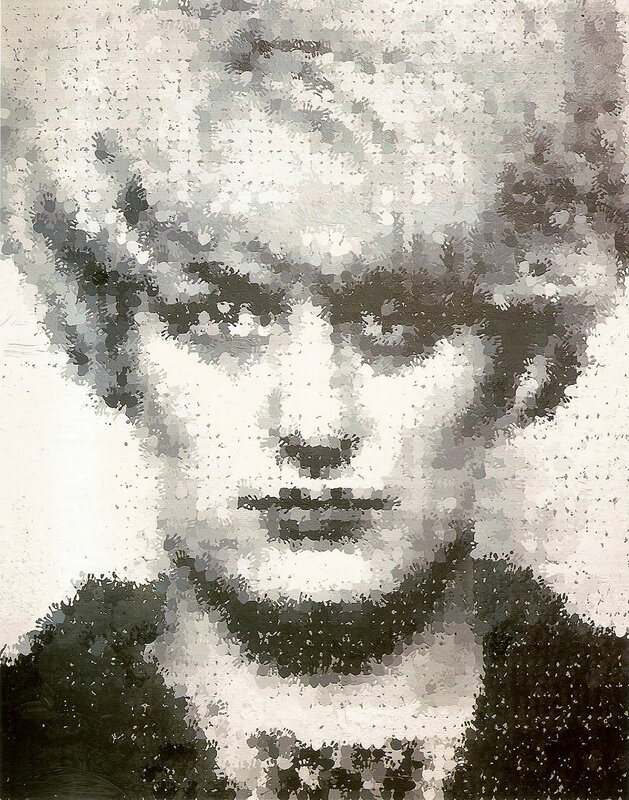 The face of infamous Moors murderer Myra Hindley stares out at the viewer, created using thousands of children’s handprints. The painting attracted massive attention in the UK, and one critic described it as juxtaposing the youthfulness of an “innocent child” with the “depraved world of adults.” This rendition of the iconic mugshot creates a mosaic that comments both upon the void between innocence and experience, and the perverse creed of media obsession. Helnwein’s hyperrealistic little girl seems straight out of a horror film. 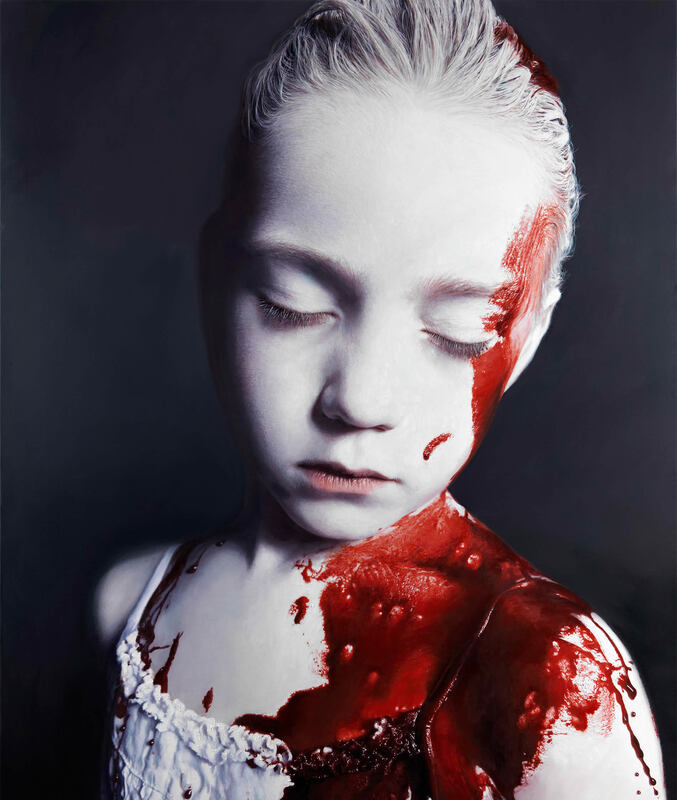 Gottfried Helnwein’s “The Disasters of War 3” is part of a larger series depicting young girls embroiled in conflict. Some art pieces feature anime girls mixed hyperrealistic children, whereas some feature more explicit symbols of war, such as toy soldiers or machine guns. This painting opts for a simpler, more striking approach; the horribly wounded and blood-spattered girl stands uncomfortably alongside a doll laid on a bed next to her. The background is a cold grey. Like Harvey’s “Myra,” we see childhood’s innocence measured up to adult atrocities. 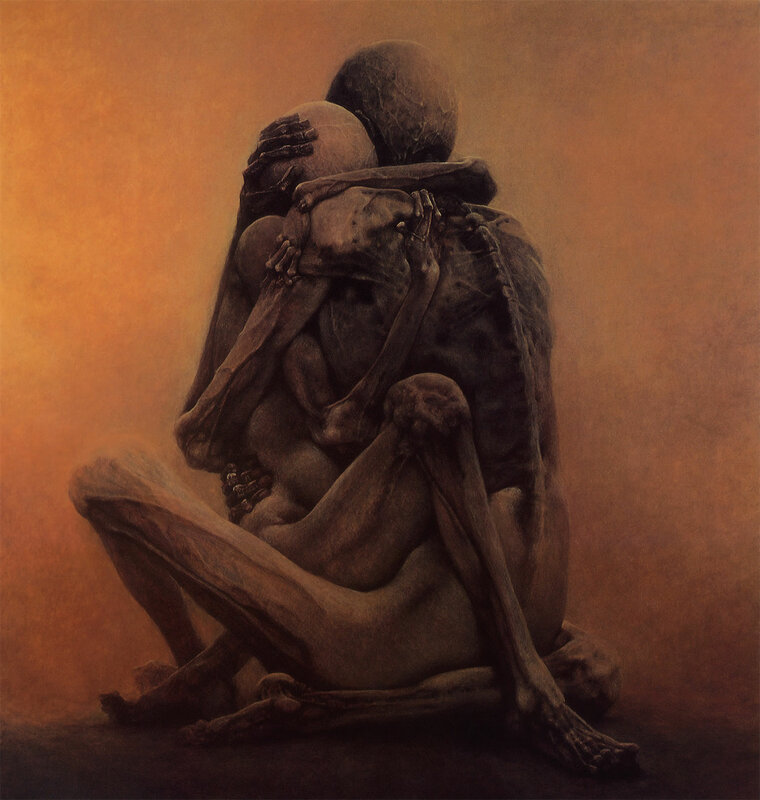 Desperate, tender, doomed—Beksinski’s couple are heartbreaking. In one of the most directly affecting pieces on this list, Zdizslaw Beksinski presents the charred and skeletal forms of a couple clinging to one another in the aftermath of some disaster. 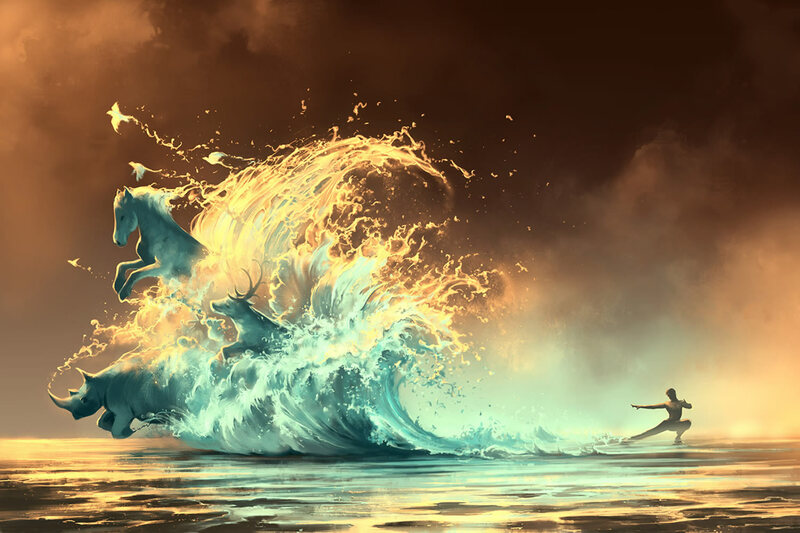 The red and orange palette suggests some form of fiery destruction, whether nuclear or solar, and the vague backdrop suggests a sandstorm whipping at their remains. The desperation in these individuals is prevalent even in death, and the brilliant combination of raw human emotion and death at its most grotesque, makes for one disturbing image. Surgeons, reptiles, and babies are just some of the tools Ishida uses to make his point. Tetsuya Ishida is my personal favourite artist from this list. 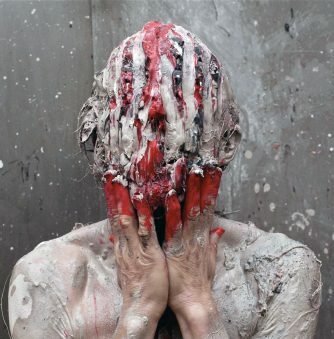 His bleak and surreal images of Japanese workers suffering abstract transformations are as bizarre as they are disturbing. 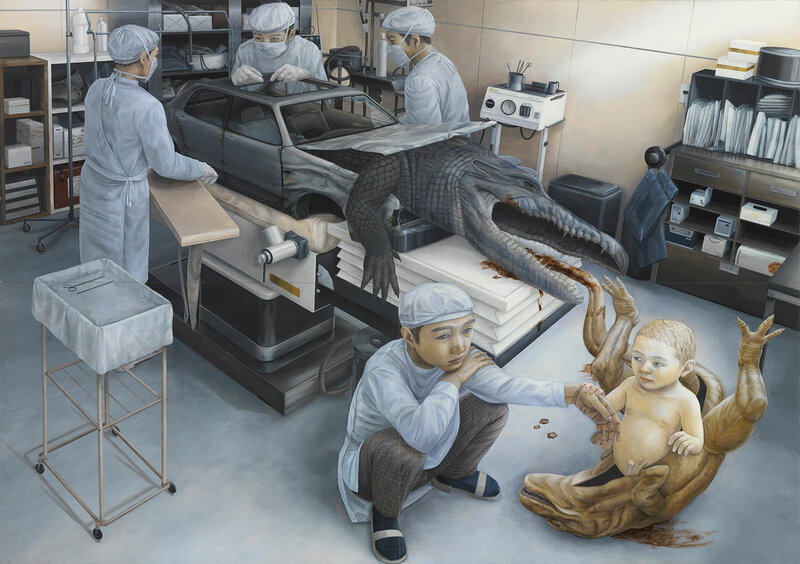 In “Descendant” we see a child born of a prehistoric dinosaur, while nearby surgeons operate on some kind of car/alligator hybrid. The implication seems to be that while the descendants of the dinosaurs are alligators and other reptiles, the descendants of the human baby are purely mechanical. 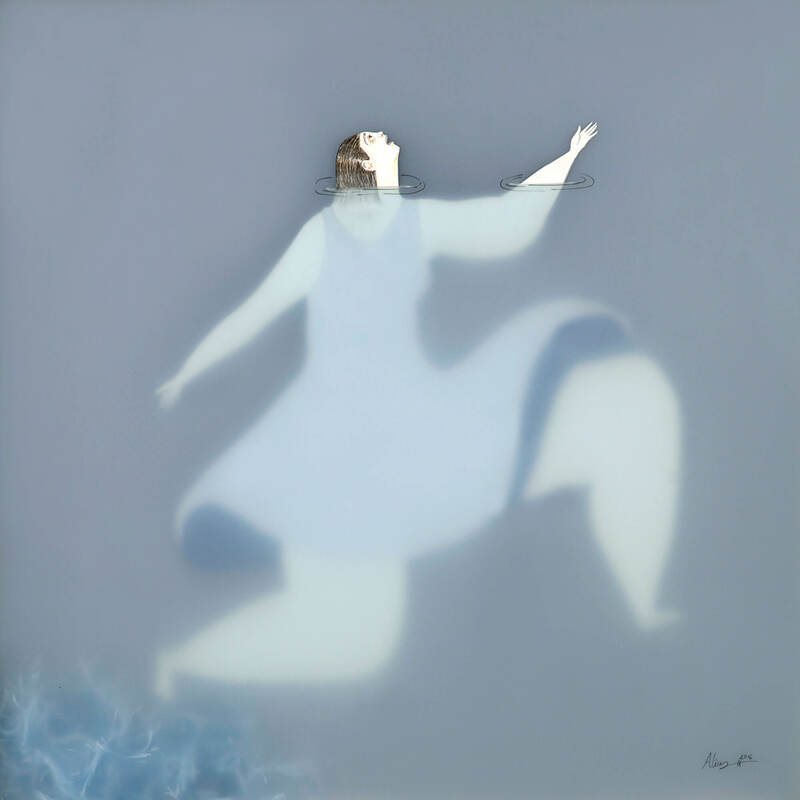 Ishida’s art almost exclusively expresses his disillusionment in the mechanistic and commercial Japanese culture, within which people are defined solely by their professions. 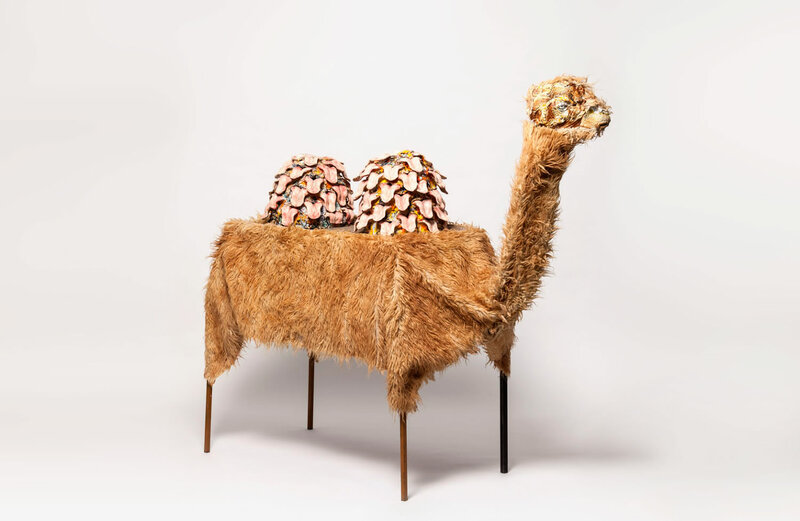 If Dr. Frankenstein made camels, they would look like Lemsalu’s. Part installation, part water feature, Kris Lamsalu’s “When the Big Trees Were Kings” is a complex and strange creation that only gains points when it’s fully operational. The tongue-humps that are lodged into the camel’s back are actually fountains, and when activated water flows from the top and trickles off the tongues in a horrible imitation of saliva. This, combined with the scrawny head, stick-legs, and constricted neck, suggest a sharp criticism of animal treatment, or more specifically, of defining animals by their uses alone. Fred is a freelance writer and postgraduate student studying American Literature at Dublin Trinity. As well as Scene360, he has published work for several UK-based arts organisations, and also edited and designed the creative writing magazine Spring 14. Follow the author @	, Twitter,	and view more articles.